As Toronto's social housing agency faces crises on multiple fronts, here's how their 2016 budget adds up. This article is part of Torontoist’s special 2016 municipal budget coverage. If you value journalism like this and you’d like to see it year-round, then you can subscribe now and help fund a staff writer to hold city hall accountable. Photo by Vik Pahwa from the Torontoist Flickr pool. The board of Toronto Community Housing grapples with competing priorities: deliver a balanced budget, or much-needed repairs and front-line services? Over the past several years, the city’s social housing provider has had its share of damning investigations, power struggles, a “climate of fear,” the whole nine yards. It’s also taken on several ambitious and controversial neighbourhood revitalizations. Now, it’s facing a massive slow-motion disaster with no easy fixes. Housing more than 160,000 people is expensive. 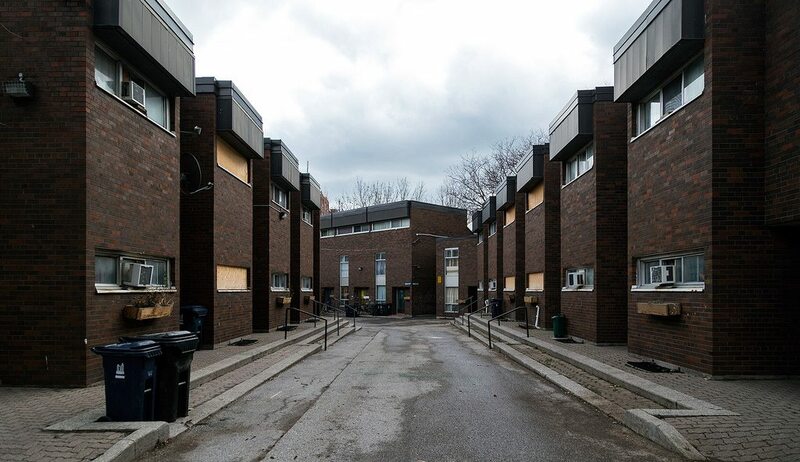 Many social housing projects were built in the ’60s and ’70s during the wave of large-scale government investment; as social housing was downloaded from the federal government to the province and then to the city, funding dried up. The buildings are now getting old, and will need billions of dollars in capital repairs over the next decade in order to remain habitable. 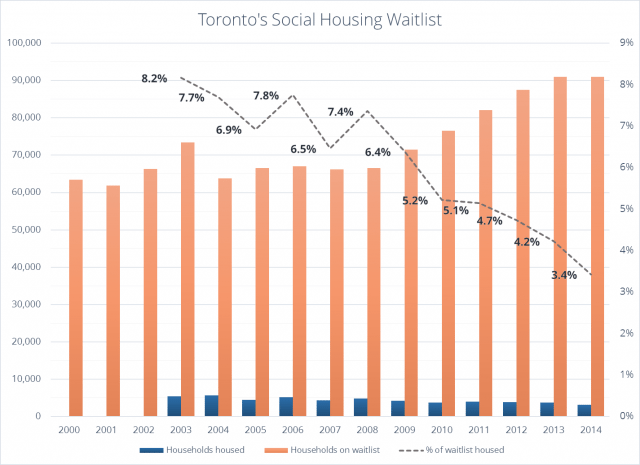 Rising rent, stagnant turnover, and chronic underfunding of affordable housing have all contributed to the ballooning waitlist. Source: Housing Connections. At the beginning of 2015, Mayor John Tory created a task force to find ways to improve TCHC’s operations and better serve its residents. Their interim report (PDF), released in July, called for TCHC to take immediate action to address poverty, building conditions, and the often-volatile relationship between residents, staff, and contractors. Two months later, TCHC responded with their own report on progress since then, as well as their plans for the immediate future. Altogether, the TCHC board’s finance committee estimates it will cost $13.7 million to carry out the task force’s recommendations. Task force head Senator Art Eggleton says as much to budget chief Gary Crawford (Ward 36, Scarborough Southwest): TCHC can save money or fix things, but they’re not in a position to do both. Maybe the mayor’s recent change of heart shows he can appreciate value for money. There certainly isn’t much extra to squeeze out of the TCHC’s billion-dollar budget2. While it sounds very big, most of their revenue (about 60 per cent) comes from rent, subsidy from the City, TCHC’s line of credit, and reserve funds—none of which are exactly cash cows. This year, another big chunk—25 per cent—comes from mortgage refinancing. Meanwhile, TCHC faces considerable operating expenses. Utility costs have gone up a whopping 35 per cent since 2012. And the pressure to improve front-line services has forced them to cut back in other areas, particularly human resources—which can constrain their ability to manage their workforce or hire people as fast as they need to. On the capital side, building repairs, like fixing long-broken elevators, have won out at the cost of participatory budgeting. The practice of giving residents a direct voice in the budget has only recently been piloted in the City budget, but TCHC has been doing it since 2001.3 Last year, $8 million was allocated to various capital projects voted on by resident budget delegates. However, the three-year capital building program presented at this year’s budget had it cut down to $5 million. The $3 million may seem like a small thing to quibble over when there’s a $2.6-billion unfunded repair backlog over the next 10 years. But it’s a small reminder that very soon, it won’t be residents or even TCHC that will be able to fix crumbling buildings—it will be up to Queen’s Park and Ottawa.